The United States Golf Association (USGA) and The R&A, golf’s governing bodies, today announced the adoption of Rule 14-1b of the Rules of Golf that prohibits anchoring the club in making a stroke. The new Rule will take effect on January 1, 2016, in accordance with the regular four-year cycle for changes to the Rules of Golf. Rule 14-1b, which was proposed on November 28, 2012, has now been given final approval by the USGA and The R&A following an extensive review by both organisations. The decision to adopt the new Rule came after a comprehensive process in which comments and suggestions from across the golf community were collected and thoroughly considered. The USGA and The R&A have prepared a detailed report to explain the reasons for the decision to adopt Rule 14-1b. The report explains the principles on which the Rules of Golf are founded, why freely swinging the entire club is the essence of the traditional method of stroke, and why anchoring is a substantially different form of stroke that may alter and diminish the fundamental challenges of the game. It points out that the Rule will still allow the use of belly-length and long putters and that a wide variety of types of strokes remain for players to use. The report concludes that the new Rule should not adversely affect participation in the game, that it is not too late or unfair to require players to comply with it and that it will remove concerns about any potential advantage that anchoring provides. It also makes clear that one set of Rules is essential to the future health of the game. “Having considered all of the input that we received, both before and after the proposed Rule was announced, our best judgment is that Rule 14-1b is necessary to preserve one of the important traditions and challenges of the game – that the player freely swing the entire club,” said USGA President Glen D. Nager. Peter Dawson, Chief Executive of The R&A said: “We took a great deal of time to consider this issue and received a variety of contributions from individuals and organisations at all levels of the game. Rule 14-1b will not alter current equipment rules and allows for the continued use of all conforming golf clubs, including belly-length and long putters, provided such clubs are not anchored during a stroke. The new Rule narrowly targets only a few types of strokes, while preserving a golfer’s ability to play a wide variety of strokes in his or her individual style. David Rickman, Executive Director of Rules and Equipment Standards at The R&A, said: “This Rule change addresses the future and not the past. 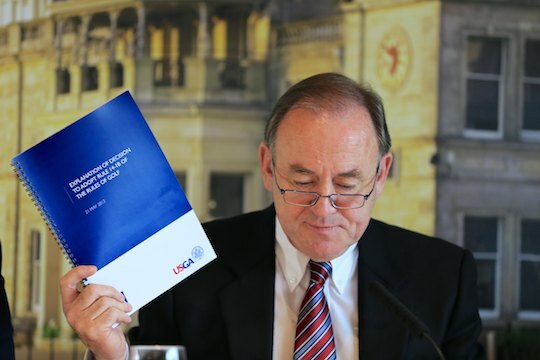 “The discussion around the Rule has been very helpful, and we appreciate that so many different perspectives were offered,” said USGA Executive Director Mike Davis.